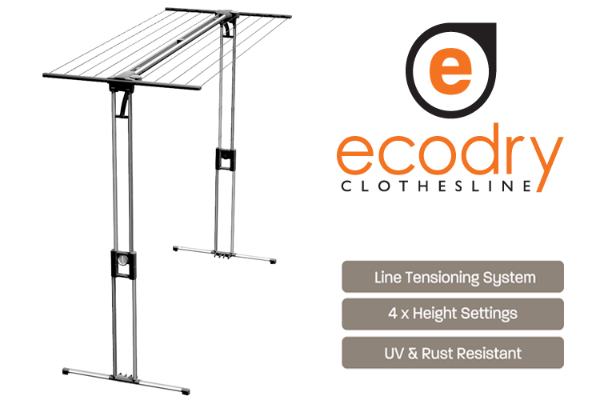 South Australian manufacturer Rope & Plastic Group is set to launch its locally-made Ecodry clothesline – a lightweight, height adjustable, portable clothesline system designed to meet the needs of a diverse range of groups including aged care, disability, and people in living in smaller spaces. The company, which was assisted by a $200,000 grant through the State Government’s Automotive Supplier Diversification Program (ASDP), is working with product designer John Packer and a number of South Australian companies to manufacture the clothesline. Automotive supplier Axiom Precision Manufacturing is supplying the plastic components, while a number of local toolmakers have been approached to develop the specialised tools needed to manufacture the plastics. In addition to this, the UV and rust resistant Ecodry clothesline – which features castors for easy moving, unique line tension adjusting dials and lever for adjusting height with ease – is being assembled at Mobilong Prison and will be distributed through SA innovator Scott Boocock’s company Hegs Pegs. Rope & Plastic Group’s Executive Chairman John Sutton thanked the State Government for the funding assistance, saying the new product will help the company survive the significant decline in its business from the automotive industry. “We see the Ecodry clothesline as our salvation and thank the State Government for providing $200,000 to help us get our one-of-a-kind product market ready,” Mr Sutton said. Automotive Transformation Minister Kyam Maher said the State Government was proud to support Rope & Plastic Group in their diversification efforts. “The Ecodry clothesline is a great example of innovation right here in South Australia, with the unique product designed to meet the needs of a wide range of customers, including the growing disability and aged care sectors,” the Minister concluded.